In 1992, I was a first-year mechanical engineering major who wanted to study abroad. I had seen a poster on campus advertising a Lafayette program to study at an English-speaking college attached to Vrije University in Brussels, Belgium. I applied and was accepted to start in fall of my sophomore year. It was the second cohort from Lafayette to study at Versalius College—it was one of the first opportunities engineering students had to study overseas. Andrew Fix, Charles A. Dana Professor of History, served as our Lafayette guardian, chaperone, teacher, and surrogate parent. Our first day started out with a scavenger hunt around Brussels. I was laden with historical clues, but had no GPS or internet to make finding answers easy. Most of us had a copy of Let’s Go Europe, and my group had stumbled on a map of the city in the main train station. Our tour took us through the city visiting famous sights such as the Grand Place and Manneken Pis, eating waffles, and learning all parts of town, even the bad. We successfully completed navigating our way around an international city. At Versalius, I took core engineering classes (circuits, statics, and differential equations) in addition to French and Fix’s course History of the Low Country. All of us were in his class, learning about Belgium, Netherlands, and Luxembourg. We traveled with Fix each weekend as he brought history to life. We had day trips to cities like Bruges, Ghent, and Mechelen, and even an overnight in Amsterdam. In every city, each of us had to prepare a brief for one stop on the tour and present it to the class. Early in the semester, these seemed to be pretty mundane assignments. But as we went from city to city, museum to museum, I learned to appreciate the lessons on diamond cutting and Spanish colonies. I remember Rembrandt’s Night Watch and a flower festival in Antwerp. I began to revere William of Orange as much as George Washington. We all were awed by Fix’s son who, oftentimes in a baby backpack, was capable of sleeping anywhere. He then regaled us with stories of the Beggars Rebellion (Gueze in French) to depose Spanish rule and then revealed that cramped table we shared was the former bedroom in the Spanish king’s apartment. When I heard of his passing, I wanted to thank him. He taught us kids that we were part of a bigger world, not the center of it. When I heard of his passing, I wanted to thank him. He taught us kids that we were part of a bigger world, not the center of it. He helped me mature as a global thinker, able to understand various viewpoints and appreciate other cultures, languages, and history. My semester in Brussels informed me. 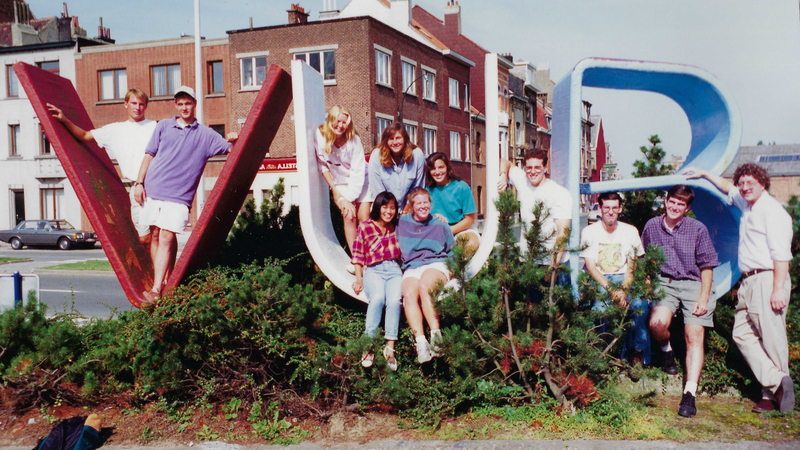 I yearned to live in Europe and secured an internship in Holland after graduating from Lafayette. Years later I lived in Switzerland and felt at home there. Back on campus in spring semester of my sophomore year, I soon was buried in engineering. But sometimes I would see Fix, and our group would occasionally get together and talk about our times there. I’d go to his home to drink elderberry wine that he had made. He saw I was a serious student who was serious about learning. And he was a serious teacher, historian, and storyteller. For a moment, we wrote our own personal histories together. For that, I am honored and thankful.